West Haven’s Bria Stanley (13) spikes the ball past Lyman Hall’s Ellery Campbell (3) and MacKenzie Regan on Wednesday. West Haven won, 3-2 (25-22, 23-25, 25-26, 25-20, 15-13). 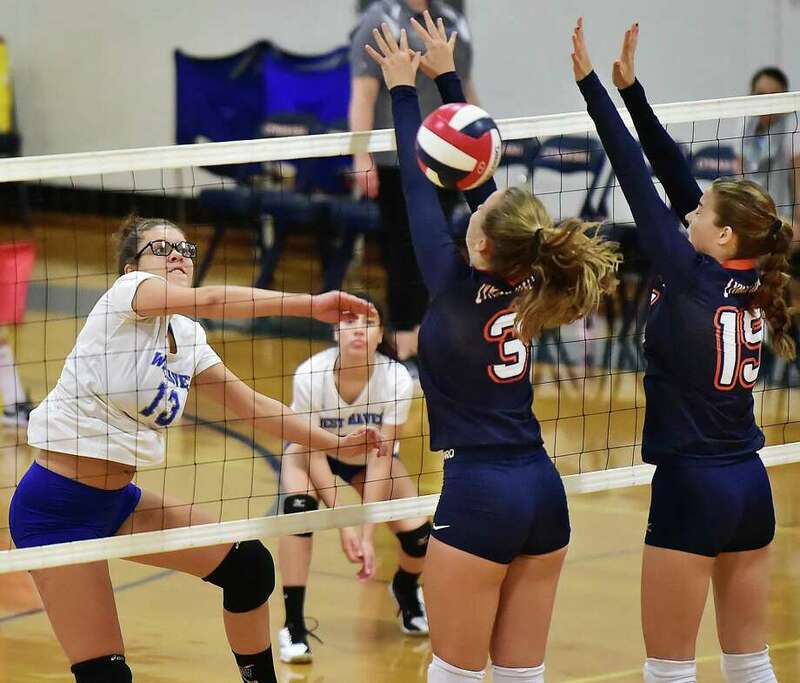 Josie Luizzi tallied 16 kills as the Brookfield High School girls volleyball team defeated Immaculate 3-1 on Wednesday for its second consecutive win to start the season. Steph Krebb 8 kills, 10 digs, 5 blocks; Alyssa Lukeski 6 kills, 8 digs; Fatima Khalid 14 assists, 2 kills, 14 digs. Josie Luizzi 12 kills, 8 digs, 2 aces; Macie Carroll 8 kills, 2 blocks, 2 aces; Emma Mangold 18 digs, 4 aces; Fernanda Hanashiro 25 assists, 8 digs. Joel Barlow: Kiara Robichaud 21 kills, 6 digs, 8 service points; Julia Mullin 5 kills, 5 digs; Kayleigh Emanuelson 24 assists, 10 service points; Riley Paradise 4 kills, 7 service points. Goals: Nonnewaug: Eva Parker 2, Lindsay Ross; Brookfield: Keira Straiton. Assists: Brookfield: Olivia Davidson. Highlights: Joel Barlow: Mia D’Amico 7 saves; Pomperaug: Jill Murray 4 goals. Scoring: K—Dixie D’Amelio 1 goal; Riley Hicks 1g; Sam Falcon 1 assist. Goalies: K—Mimi White (18 saves). Goals: Darien: Johan Tripitelli, 13:00.Trumbull: Tiago Frazao, 33:00. Goals: Mercy: Madison Webster, 33:20. Goals: Hamden: Keegan Bailey (from Sonia Ferri), 33:20.Hamden: Keegan Bailey (from Caroline Ennis), 33:20. Goals: Lauralton Hall: Molly Rotondo, 33:20.Lauralton Hall: Molly Rotondo, 33:20. Lauralton Hall: Sara Bartoli, 33:20. Foran: Sara Portoff., 33:20. Goals: Sacred Heart Academy: Sherlynn Vendome (from Megan McMillen), 5:00.Sacred Heart Academy: Gabriella Groves (from Camila Mora-Cyrus), 26:00. Branford: Melanie Sachs (from Alayna Boileau), 37:00. Sacred Heart Academy: Sherlynn Vendome (from Camila Mora-Cyrus), 39:00. Sacred Heart Academy: Megan McMillen penalty kick. 53:00. Goals: St. Joseph: Mary Lundregan, 53:00.St. Joseph: Mary Lundregan, 53:00. St. Joseph: Mary Lundregan, 53:00. St. Joseph: Ashley Collins, 53:00. St. Joseph: Annie Stook, 53:00. St. Joseph: Maddie Leifer, 53:00. St. Joseph: Chloe Mattison, 53:00. Goals: Amity: Audrey Marin, 50:37.Amity: Audrey Marin, 56:41. Goals: Cheshire: Lila McNamee (from Marisa Brough), 20:00.Daniel Hand: Kayla Howard, 44:00. Goals: Bunnell: Allison Curcio, 44:00.New Fairfield: Alessandra Bassani, 44:00. New Fairfield: Nicole Manning, 44:00. New Fairfield: Kerrigan Quinn, 44:00. New Fairfield: Kerrigan Quinn, 44:00. New Fairfield: Sydney O’Connor, 44:00. Goals: Pomperaug: Camryn Ward; Newtown: Emma Curtis. Assists: Pomperaug: Maddie Mooney. (at Canterbury School): 200 medley relay: 1. Masuk (G. Sardinha, A. Clausen, M. Fiore, T. Pallas) 2:02.93, 2. New Milford (E. Padros, T. Baranov, K. Hornkohl, S. Falder) 2:07.18, 3. New Milford (S. Gustas, I. Damnino, H. Clark, K. Karl) 2:23.32; 200 freestyle: 1. L. Stoelzel (M) 2:04.5, 2. B. Young (M) 2:19.59, 3. O. Frost (M) 2:25.83; 200 IM: 1. E. Padros (NM) 2:23.75, 2. M. Didio (M) 2:28.15, 3. S. Falder (NM) 2:31.04; 50 freestyle: 1. K. Hornkohl (NM) 26.13, 2. E. Stone (M) 28.10, 3. Z. Helmke (M) 28.81; Diving: 1. R. Kirby (NM) 176.25, 2. J. McCorry (M) 159.45, 3. S. Beck (NM) 135.1; 100 butterfly: 1. M. Didio (M) 1.08.63, 2. T. Baranov (NM) 1:15.39, 3. K. Karl (NM) 1:20.22;　100 freestyle: 1. K. Hornkohl (NM) 59.28, 2. E. Stone (M) 1:01.27, 3. D. McGunnigle (M) 1:03.59; 500 freestyle: 1. S. Falder (NM) 5:38.63, 2. B. Young (M) 6.06.33, 3. T. Baranov (NM) 6:38.34; 200 freestyle relay: 1. Masuk (M. Didio, D. McGunnigle, B. Young, M, Nicholas) 1:54.71, 2. Masuk (K. Murdorf, A, Smith, O. Frost, K. Kirberger) 2:10.39, 3. New Milford (V. Gent, I. Damnino, J. Couliard, L. Veto) 2:12.63; 100 backstroke: 1. L. Stoelzel (M) 1:03.5, 2. E. Padros (NM) 1.05.53, 3. A. Mihalek (M) 1:21.47; 100 breaststroke: 1. M.. Nicholas (M) 1:15.26, 2. K. Karl (NM) 1:26.22, 3. K. Kirberger (M) 1:30.69; 400 freestyle relay: 1. New Milford (K. Hornkohl, T. Baranov, E. Padros, S. Falder) 4:05.63, 2. Masuk (Z. Helmke, B. Young, E. Stone, L. Stoelzel) 4:08.07, 3. New Milford (K. Bradshaw, S. Gustas, V. Gain, H. Clark) 5.01.26. Bethel 20, Joel Barlow 35; Joel Barlow 15, Bunnell 47; New Fairfield 15, Joel Barlow 46; New Fairfield 18, Bethel 40; Bethel 15, Bunnell 40; New Fairfield 15, Bunnell 50 (at Barlow) — 1. Kayla Cohen (NF) 20:53; 2. Sammi Ruggiero (NF) 21:57; 3. Ashley Hubert (NF) 22:29; 4. Jordan Siemonsen (NF) 22:30; 5. Miranda Anastasakis (Be) 22:47; 6. Nicole Popham (Be) 22:57; 7. Sara El Moustakim (Be) 23:29; 8. Tess Dougall (JB) 23:35; 9. Grace Hesselbacher (NF) 23:37; 10. Hayley Greco (NF) 23:53. (at Hamden) Team scores: Amity 17, Sacred Heart Academy 44; Sacred Heart Academy 25, Lyman Hall 31; Mercy 23, Sacred Heart Academy 32; Amity 15, Lyman Hall 48; Amity 23, Mercy 38; Mercy 23, Lyman Hall 34. Individual results: 1. Rachael Cipolla (MERCY) 22:18; 2. Madelyn Ciskowski (AMITY) 22:23; 3. Ariana Garay (AMITY) 22:26; 4. Mae Grochowski (MERCY) 22:30; 5. 5 4 Abigail Bowser (AMITY) 22:36. Team scores: Hand 20, Hillhouse 35; Hand 16 Branford 45. Individual results: 1 Anna Steffen (Hand) 20:00; 2. DeJanay Davis (Hillhouse) 21:28; 3. Jada Boyd (Hillhouse) 21:28; 4. Madison Rotermund (Hand) 21:29; 5. Jade Law (Hand) 22:16. (at Shelton) 5K Team results: Shelton 15, West Haven 50; Shelton 20, Lauralton Hall 36; Shelton 26, Sheehan 31; Lauralton Hall 15, West Haven 50; Sheehan 15, West Haven 50; Sheehan 25, Lauralton Hall 31. Individual results: 1. Lizzie Brown (MTS), 20:36; 2. Anna Weissenberg (SHS), 21:10; 3. Alli Kenealy (SHS), 21:37; 4. Arianna Amodio (MTS), 23:00; 5. Maeve Sheldon (Shelton), 23:01. Team scores: Amity 15, Notre Dame-West Haven 50; Notre Dame-WH 25, Lyman Hall 34; Xavier 15, Lyman Hall 50; Xavier 20, Amity 42; Xavier 15, Lyman Hall 50. Individual results: 1. Connor Visnic (AMITY) 16:33; 2. Peter Schulten (Xavier) 17:00 ; 3. William Curran (Xavier) 17:07; 4. Dillon Selfors (Xavier) 17:09; 5. Julen Lujambio (Xavier) 17:19. 3 miles at Madison. Team scores: Hand 19, Branford 44; Hand 15 Hillhouse 50; Branford 22 Hillhouse 38. Hand at Cheshire, ppd. to Oct. 25, 6 p.m.
Shelton at Law, ppd. to today, 4:30 p.m.
Simsbury at Cheshire, ppd. to Friday, 4 p.m.
Sheehan at Hand, ppd. to Friday, 4 p.m.